The Memoirs of Sherlock Holmes are overshadowed by the event with which they close—the meeting of the great detective and Moriarty, the Napoleon of Crime. When "The Final Problem" was first published, the struggle between Holmes and his arch nemesis, seemingly to the death, left many readers desolate at the loss of Holmes, but it also led to his immortality as a literary figure. The stories that precede it included two narratives from Holmes himself—on a mutiny at sea and a treasure hunt in a Sussex country house—as well as a meeting with his brilliant brother Mycroft. 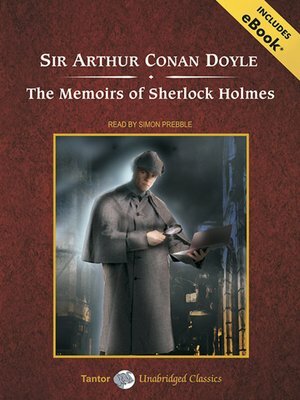 Included in The Memoirs of Sherlock Holmes are "Silver Blaze," "The Yellow Face," "The Stock-Broker's Clerk," "The 'Gloria Scott,'" "The Musgrave Ritual," "The Reigate Puzzle," "The Crooked Man," "The Resident Patient," "The Greek Interpreter," "The Naval Treaty," and "The Final Problem."